American Surreal | "I Prefer Their Old Stuff"
« The Octopus is coming! In the late fifties and sixties my father got hooked on surfing, despite living in the UK and not living anywhere near a beach that you could surf on (I don’t think Avonmouth or Weston-Super-Mare have ever been surfing Meccas!) he and the family went to Cornwall every summer, a habit that continued after I was born and up until he died in 1984 (although he had stopped the surfing some years before). He had even made his own 9′ long board out of glass fibre which was no mean feat! Consequently when I was around six or seven years old I used to enjoy leafing through his stack of surfing magazines, this would have been in the mid seventies so the adverts and comic strips inside were not exactly politically correct which is more than likely why I enjoyed flicking through them, getting a peek at something I shouldn’t at my age! I don’t remember which particular magazine it was but a fair few of them had comic strips and illustrations by Robert Crumb and I was fascinated by the amount of detail he would cram into his pictures, I would spend hours just poring over the pictures, I certainly didn’t understand the writing or jokes. My dad was also a big classical music fan and he would let me look through his collection of vinyl LPs and encourage me to listen to whatever I wanted (not that it has made me a massive fan of classical, I have a fair few of his old records I inherited but haven’t played many of them). One of the records was a recording of Mussorgsky’s Night on a Bare Mountain, I’d fallen love with the piece when I’d watched Fantasia, the darkness of the music and scary images really appealed to me, especially alongside the album cover which depicted a scene from In The Garden of Unearthly Delights by Heironymus Bosch (the scene on the right pane) which was also awash with little details that I would also pore over. All this is why I felt an immediate attraction to the work of American artist Todd Schorr when I discovered him recently. I was looking around the David Hockney gallery in Salts Mill in Saltaire near Bradford a couple of months ago and came across one of his books “Dreamland”, the lurid technicolour artwork on the cover really catching my eye. Schorr’s work is part of the LA art movement known as “Lowbrow art” and is heavily influenced by comics and cartoons including twisted Disney style characters and characters that would have been too weird even for Chuck Jones to consider putting on film, he has also stated that Dali was a heavy influence (he even featured the iconic painter in this particular piece). But other than this the one thing that attracted me above all else was again the amount of tiny details included in his paintings, every time you stare at one there is more you have not seen before. 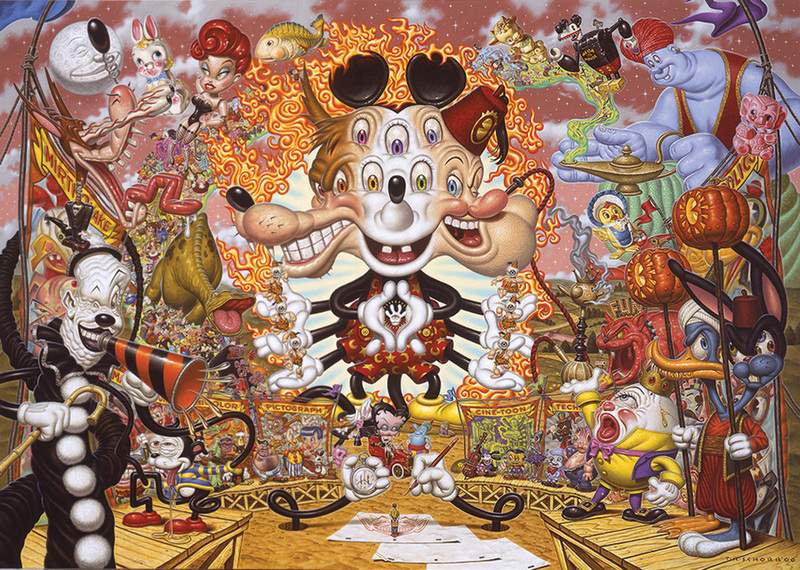 Even at this size it is difficult to appreciate just how detailed this painting is, in real life it is 8ft x 5ft (you can see detailed extracts of it at Todd Schorr’s website) He has also done another “Spectre” painting, “The Spectre of Monster Appeal” which was bought by a certain Leonardo DeCaprio! He got into quite a bit of hot water from the American Christian right for his painting “Clash of Holidays” which depicts Santa Claus in a knife fight with the Easter Bunny while an infant christ wearing a crown of thorns munches on the ear of a chocolate bunny (here) when it was exhibited as part of a retrospective in Florida in 2002. A lot of his work has satirical or political meanings, or, as the “spectre” paintings above, are self portraits of a sort, the tiny figure of the small boy at the bottom centre of both pictures is meant to represent Schorr as a child, in the cartoon painting he is holding a sketch pad and is confronted by two Mickey Mouse style hands holding the animator’s stopwatch and pencil. In the monsters painting he is clutching a Halloween devil mask as every monster you can think of from films, books or comics cascades down around him. I would dearly love to be able to have a full size one of these covering my walls! With some Amazon vouchers I received at Christmas I have now bought “Dreamland” and I wish my seven year old self could have a browse through it as the paintings within are quite captivating. They are certainly not for everyone, I can think of a fair few friends and relatives that would hate it and find it quite disturbing, but as the old saying goes “I may not know much about art, but I know what I like”! This entry was posted on January 12, 2011, 12:48 pm and is filed under Uncategorized. You can follow any responses to this entry through RSS 2.0. You can leave a response, or trackback from your own site. I really like how you lead into the main subject of this excellent post with such personal reminiscences of your Dad. 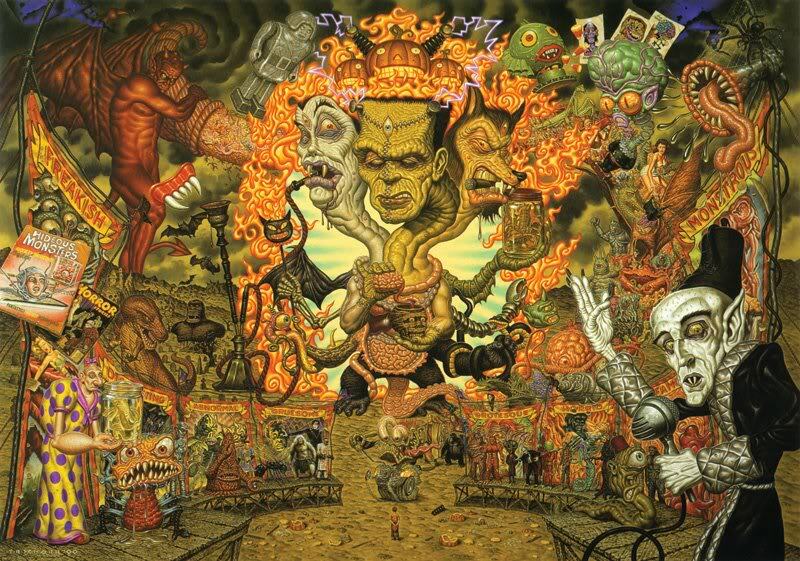 I’ve not of Todd Schorr before and these are amazing artworks so thanks for letting me know about him.